Adventurous and exotic pre-dinner drinks in Sarawak and Sabah. A sophisticated and enticing entree in Kuala Lumpur. A main feast for the senses in Johor. Tempting and traditional dessert in Penang. All washed down with accompanying cocktails featuring epochal regional flavours. What if it were possible for you to travel the four regions of Malaysia in one night, sampling each region’s best fare? 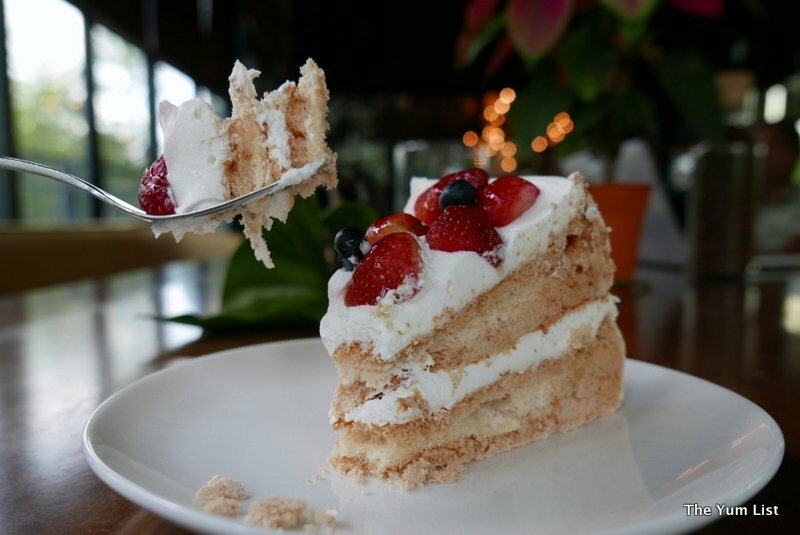 For many years, fine dining in Kuala Lumpur has been founded on imported cuisines, with dishes, tastes, preparation methods and ingredients from Europe, North and South America, Northern Asia and the Pacific. Local flavours, recipes and produce were often relegated to mamaks and street food carts. Not that we don’t all love a gluttonous street market visit from time to time, but sometimes you just want to relax in beautiful surrounds, a flamboyant drink in hand, whilst you engage in all the pomp and circumstance of a multi-course dining experience. And for all the buzz and excitement of street dining, the quality and freshness of hand-picked ingredients, the sophistication of the flavour combinations, and the unmatched skill and precision of professionally honed preparation techniques, made to order, elevate the familiar to the transcendent. The elegance is in the time taken, not only to prepare but to enjoy, to savour, to experience. 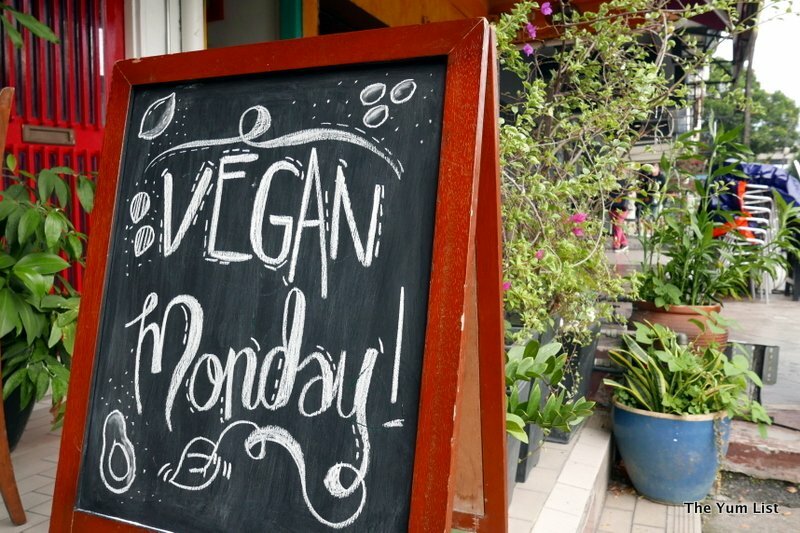 Slowly, but surely we are seeing a surge of unique local ingredients being integrated into the menus of KL. Cardamom, lemongrass, chilli, turmeric and other pungently layered spice blends are all making their way onto the cocktail and restaurant scene. Paired with stirrings of coconut, peanuts, calamansi and rambutan, splashes of osmanthus and chrysanthemum, and even hints of jackfruit and sambal among others. Clearly, it is Malaysia’s time to shine. The opening of Beta KL is set to fix the spotlight firmly on this colourful nation’s character and personality. 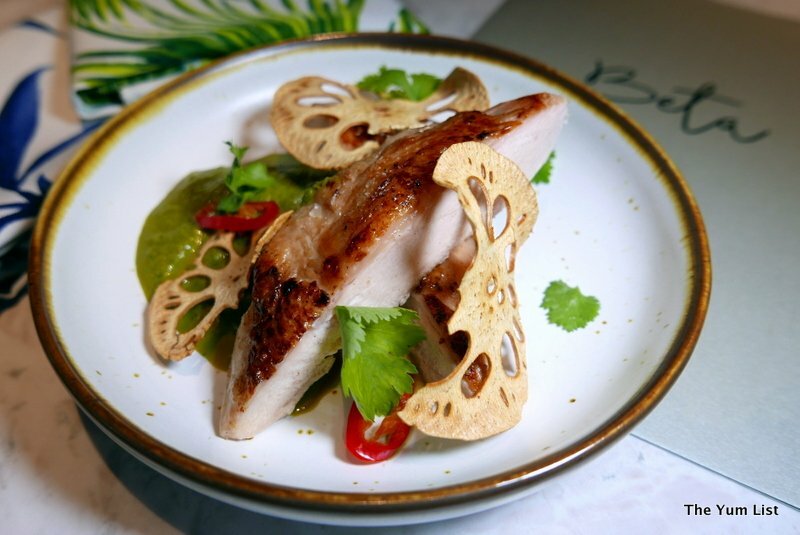 With so many diverse and complex iconic dishes from each of the four corners to choose from, the talented team behind Skillet @ 163 decided to take on the challenge of designing a new venue that celebrates all that Malaysian food and drink has to offer. 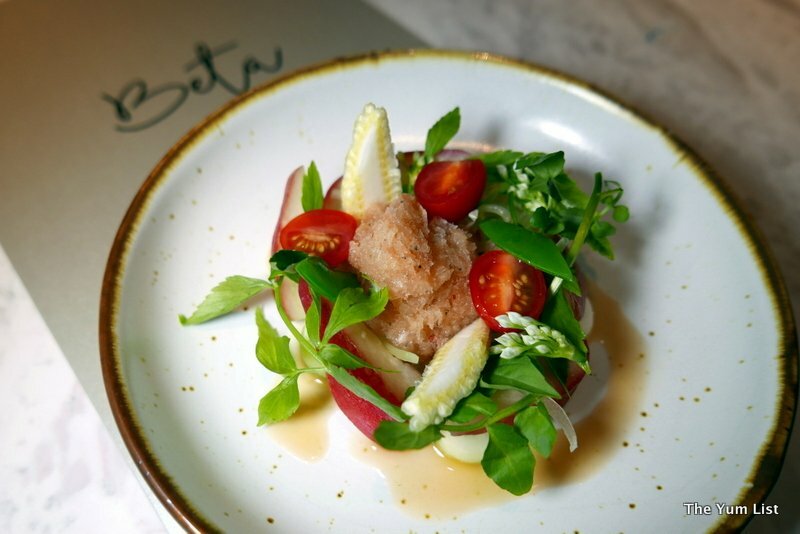 Situated in the same location their second restaurant, a ‘restobar’ dubbed Beta, shares its title with the King’s word for ‘I’, a highly apt naming choice as you will “Dine like a King”. 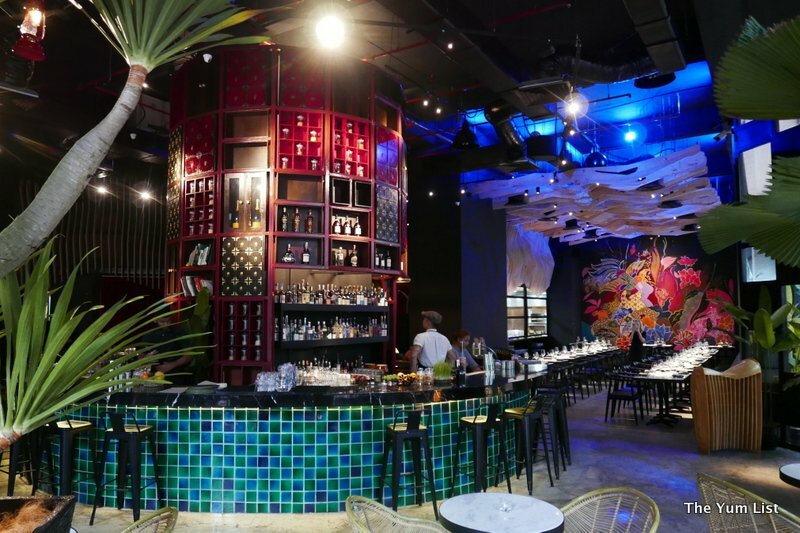 The restobar is designed to showcase the best flavours of Malaysia, with decor and settings, cocktail and bar menus, and restaurant dining menu each celebrating North, South, East and West icons of cuisine. Beta is split into three sections and director Kelvin takes us for a tour. A layered staged drinking space perfect for events and people watching occupies one corner, a conservatory-esque light-filled indoor garden space for leisurely sipping and snacking is in another. The bulk of the space is filled by an upscale dining area with batik painted mural and concertina windows that open to bring the outside in. At the centre of these three ‘regions’ is the circular bar, a spectacular tower of red, black and gold apothecary drawers, canisters and jars rising out of vibrant jade tiles. Serving modern contemporary Malaysian, the restaurant is open from 12pm-3pm for lunch, and 6pm-10pm for dinner, while the bar operates from 5pm-1am. Only weeks into their soft launch, these times may be expanded or altered in the future, in response to demand. 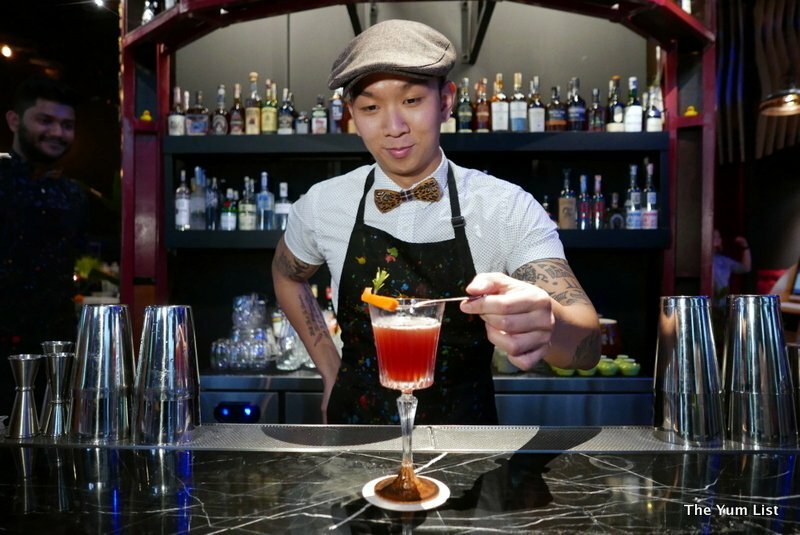 Harry and Alvin, formerly of Birch and APW Bangsar, are manning the bar this evening, and talk us through their menu, which showcases three feature cocktails each from East, South, North and Central regions and two sharing bowls from Eastern Malaysia. 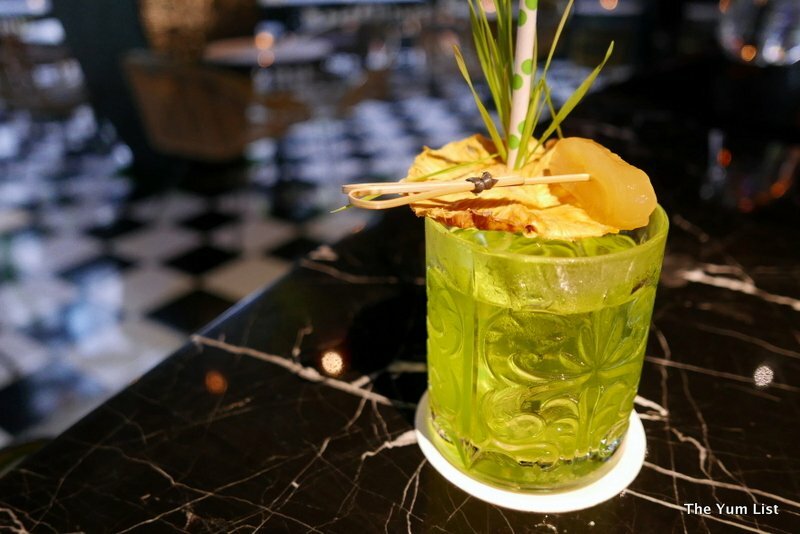 Designed to take guests on a “Liquid journey through time with a modern interpretation of classic cocktails inspired by the culture and history of the regions of Malaysia”, they have managed to capture the essence of each location in its representation. While all the options are daring and highly original, bespoke cocktails can also be made. 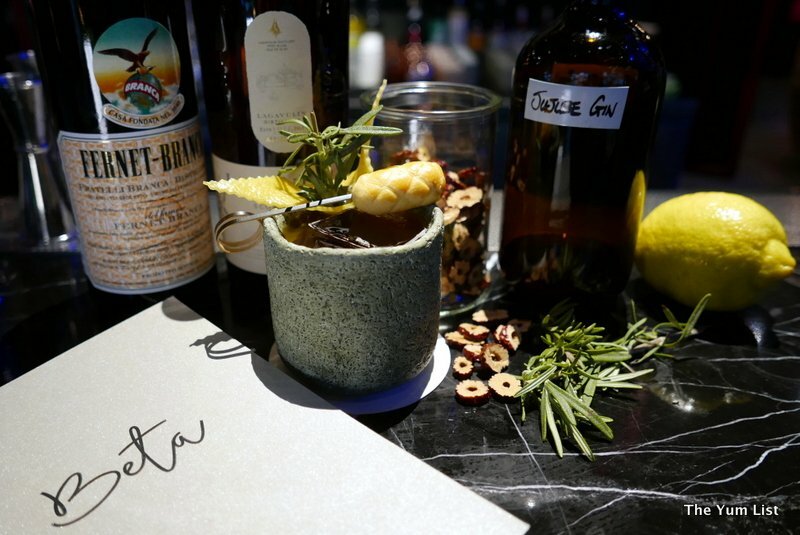 The menu is further supplemented with a wide array of top-shelf imported spirits, and house pouring wines. Beginning our journey in the East, with light, refreshing and citrusy tones to reflect the beach and forest, we are served a Harvest Sour (RM42). A reimagined Pisco sour, it has a Genever base, a malty gin made in the Dutch production style and lacking the typical juniper. 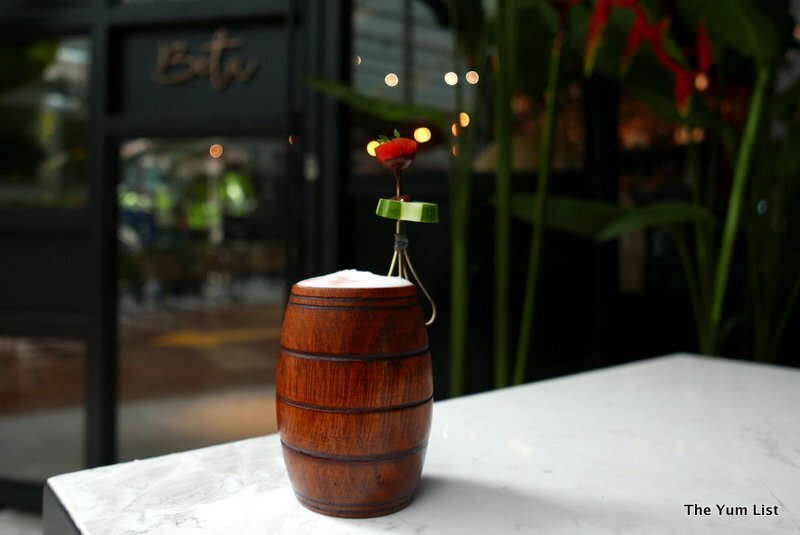 The Bols Genever is matched with saccharine rambutan, biting grapefruit, frothy egg white, a kick of rice wine, and a surprising punch of curry. My first ever curry inspired cocktail, the real surprise turns out to be why I haven’t encountered it before. It is thirst-quenching and cooling. The Jungle Colada (RM40) from the south is a clean and purified Pina Colada without the calories: toasted coconut Brazilian Cachaca distilled from sugarcane, clarified ‘homemade’ pineapple syrup, heady lemongrass and allspice topped with CO2 for bubbles, with a garnishing clutch of wheatgrass and a slice of dehydrated pineapple. Fizzy and aromatic, it is very easy to drink. To add the missing calories, we snack on Eastern Sago (RM30). Parcels of delicately crumbed poached shrimp with a double-up of laksa and sambal aiolis on top of a sago squid-ink cracker, the mouthfuls pack a decent amount of heat. Spice lovers won’t be disappointed. Served in an ornate crystal glass with a flame toasted cinnamon stem exuding smokey and burnt spice aromas, The Eastern Stew (RM42) takes us North. A double layering of apple brandy Calvados is built upon in-house duck-fat washed brandy, and further enhanced by spiced wine, rice malt, lemon and coriander. During the washing process, the duck fat imbues all it’s flavour before the fat is cooled, solidified and removed along with the guilt. Light yet intense, the drink has the sultry tannins of spiced wine with the fruity tartness of apples and lemons. Perfectly pink, it is garnished with a carrot stick and rosemary sprig. No bar is complete without a pink offering, and Beta KL restobar’s version is no slouch. Our next bar morsel is the Ox Tongue (RM27), using mainly local produce, the slow cooked then grilled ox tongue slivers are folded on top of a creamy masak lemah, or turmeric coconut curry, which ironically chef Raymond learnt to make in England of all places. Pickled star fruit and edible choy sum flower add the finishing touch to a complex array of harmonious tastes. The Hybrid Brew (RM42) is a twist on the classic Hanky Panky, originally designed by Ada ‘Coley’ Coleman for the Savoy in the early 1900s. House-made Jujube, or Chinese red date infused gin is matched with coffee vermouth, herbal Italian Fernet Branca, Islay Whisky and Lapsang Souchong Tea. Malaysia is the only country I’ve travelled to where coffee and tea are drunk combined, and before serving this mix is poured Teh Tarik style to enhance the pairing. To finish it is topped with lemon rind, a flamed rosemary sprig and a Baba Nonya ‘pineapple tart’ mini pastry for an additional snack. Smoky, dry and rich in the back of the throat, it has none of the typical burning sensations that usually accompanies strong liquor. As a final tip of the hat to Malaysia’s diverse cultural medley, the bar serves us an Inverted Karipap (RM30). A crispy potato skin outer encircles a smooth and creamy citrusy inner with a sprinkle of star anise and cardamom herbs, painted with a splash of gold because we are dining as royalty after all. 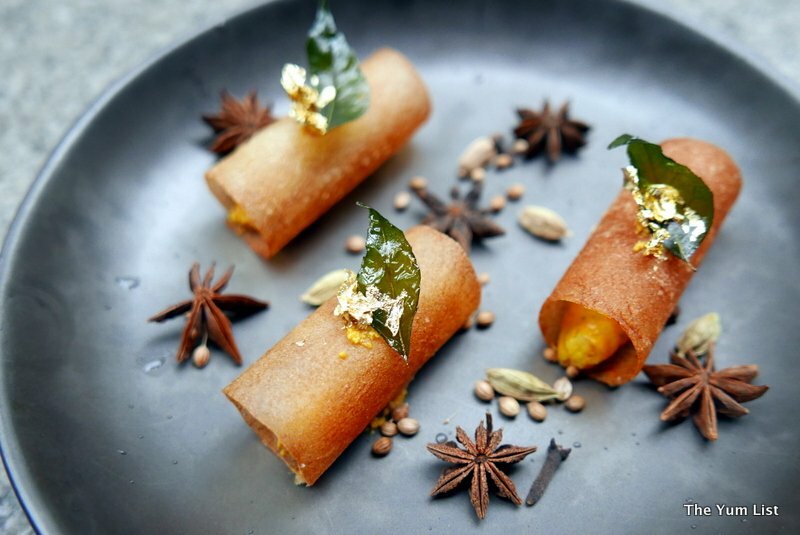 Deconstructed and reimagined, it is a supreme elevation of the humble and much-loved curry puff. 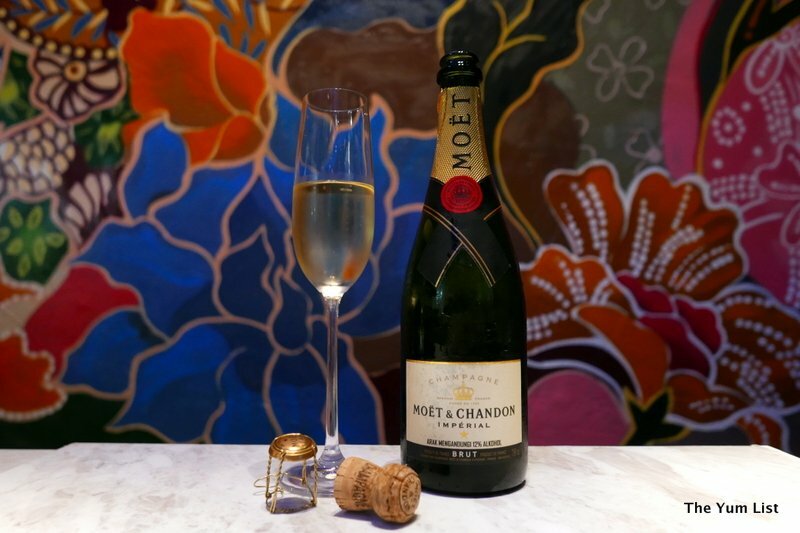 Raising a glass of Moȅt & Chandon Brut Champagne (RM58 per glass, RM380 per bottle) to the creators of Beta KL, we embark on our food voyage. As a lover of salad, I often run the risk of being underwhelmed by what is on offer. To my delight, the Spicy Garden (RM32) is refreshing, sweet, spicy and exciting. Inspired by the North, kangkung, or water spinach is delicately arranged alongside Syzygium jambos, or rose apple, and fresh local cucumber, turnips and cherry tomatoes. In the centre is a large spoonful of cincalok granité, or a shaved ice of fermented shrimp with chilli and lime, covered in a sambal dressing. The heat of the dish is juxtaposed with the soothing ice, producing an incredible sensation. 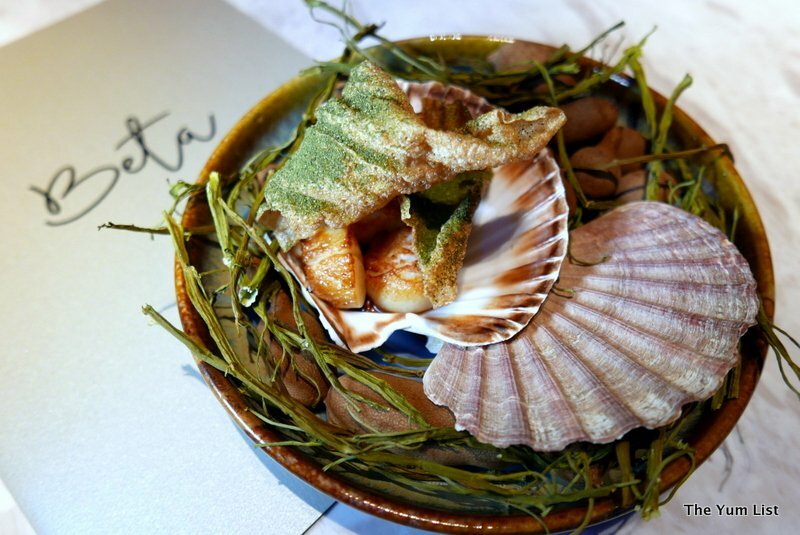 The artfully arrayed Scallops (RM60) arrive, peaking out from their seashell bed nestled amongst river stones and dried kankung arranged to look like seagrass. 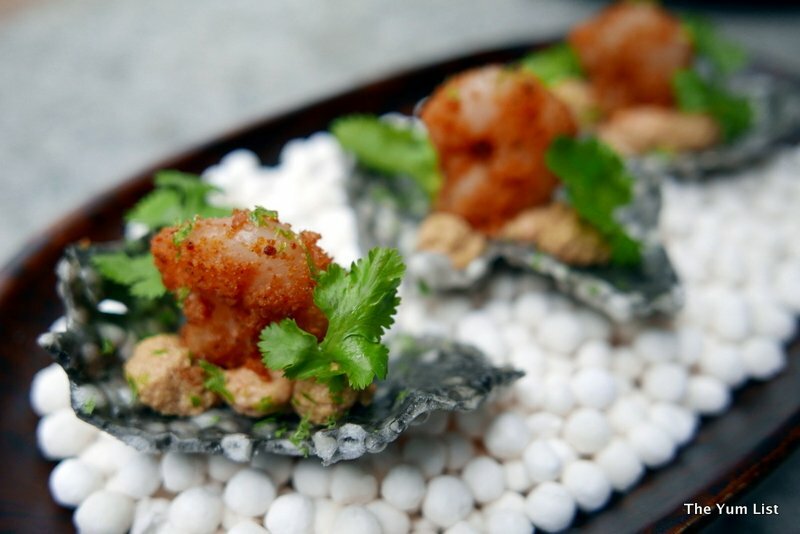 Bursting with juice, they come with a sweet and intensely spicy peanut sauce, and are topped with a stately curl of dried scallop crepe sprinkled with powdered kangkung. Based on the Northern dish of sotong kangkung, usually made with cuttlefish, the scallops make for a more regal addition. 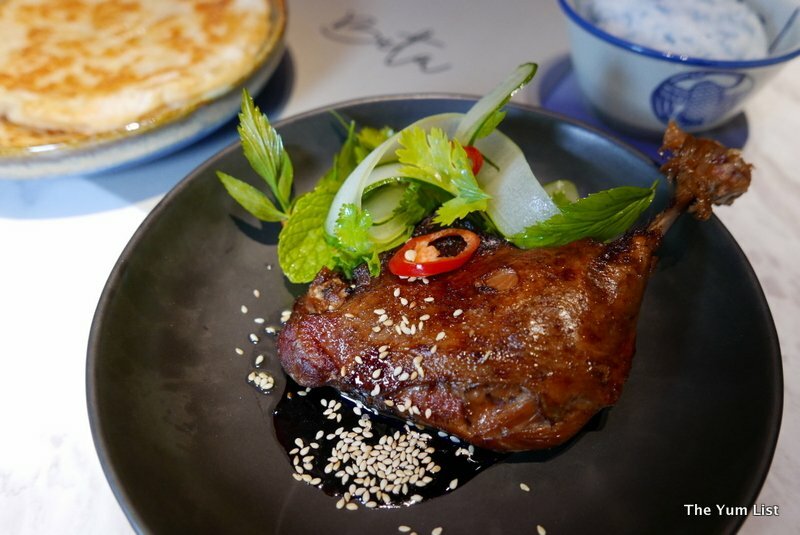 From the Chinese Muslim Baba Nonya fare of Melaka comes the Peranakan Duck Leg (RM60). Twice cooked for extra tenderness and depth of flavour, the slow cooked leg is then sealed with a final quick oil bath to give it a crisp outer coat. Coated with a sticky sesame and fermented black bean sauce it is served with a light and punchy cucumber, mint, coriander and chilli salad. To soak up the extra sauce, a bowl of glutinous steamed blue rice (RM5) is a good choice, taking its colour from an extract of butterfly pea flower. A playful rivalry over who makes the best Soft Shelled Chilli Crab has existed between Malaysia and Singapore for as long as anyone can remember. Beta KLss version (RM45) makes for a strong contender, with a generous portion lightly cooked through to make the shelled meat doughy yet crumbly. 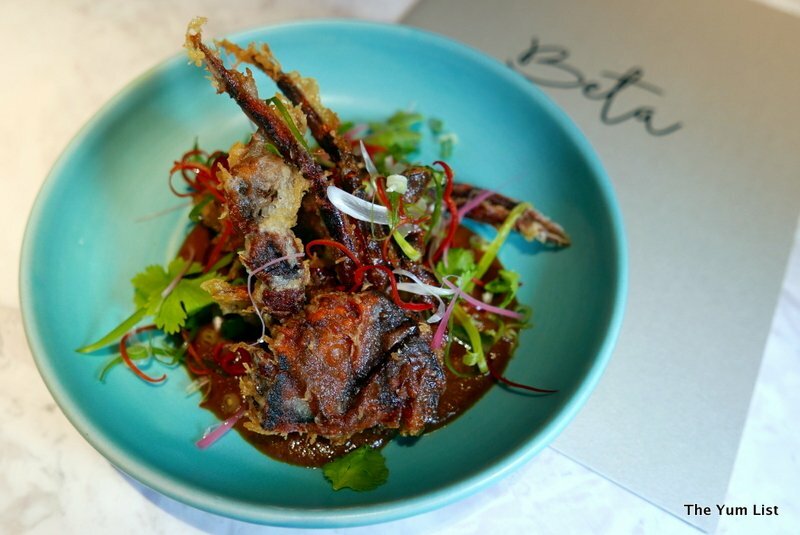 A complex mix of chilli and ginger based spices is not shy on the palate, and unlike many other competitors, Beta’s dish has not been over-oiled. There is something indescribably satisfying about biting down on soft-shelled crab, feeling it bend, resist and give way to your crunch. It is primitive, almost animalistic. Cooked in a mild and subtle batter, with ribbons of onion, chilli, eschalot and coriander, on a spread of rich satay, this is the choice of the menu for seafood lovers. An additional serve of roti (RM8) is the perfect accompaniment for soaking up any leftover satay sauce. The Chicken (RM45) is designed to reflect the East and is topped by thick dramatic curls of fried lotus. Most extraordinary, it comes abed a slather of Bentong ginger pesto. The illusion of a traditional European pesto is smashed upon tasting, with the piquant, creamy, yet unexpectedly strong ginger weaving itself through each mouthful. Taken with steamed blue rice, the smokey, gingery chicken is a cleaner, more fulfilling Chicken Rice. Our last mains dish for the evening is another standout, and a combination of flavours that will strike at the heart of most Malaysians, with Chef Raymond integrating tamarind and kaffir lime to evoke elements of nostalgia common to the childhoods of many of his staff. 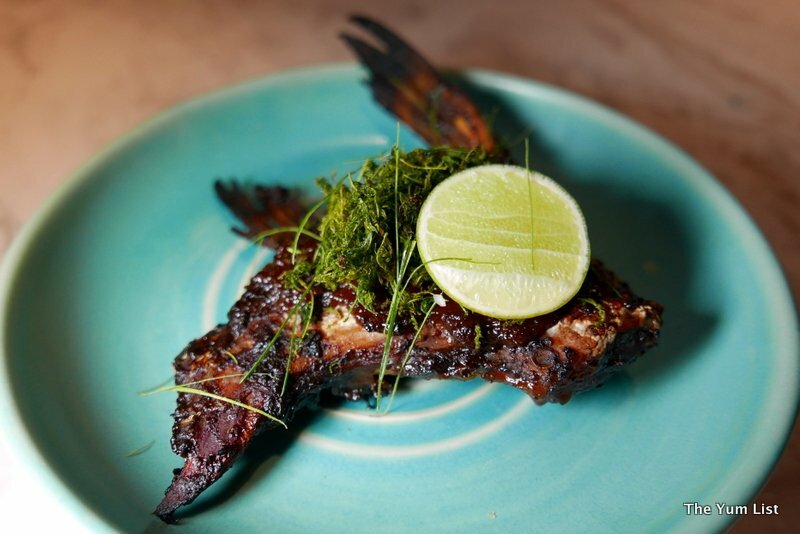 The Fish Collar (RM60) from the North, combines the flavours of meaty barramundi – oft considered the ‘Black Angus’ of fish, with tangy, sweet-sour tamarind. Topped with shredded pucuk petai, or cha-om petai, sometimes known as ‘stinky bean’, the local bean known for its pungent aroma when raw changes flavour entirely when cooked becoming more agreeable and mild. With excellent detoxifying properties, it adds a health-conscious option to the light, salty and tangy tamarind dressed fish. For dessert, we are served two options, each as strikingly theatrical in presentation. 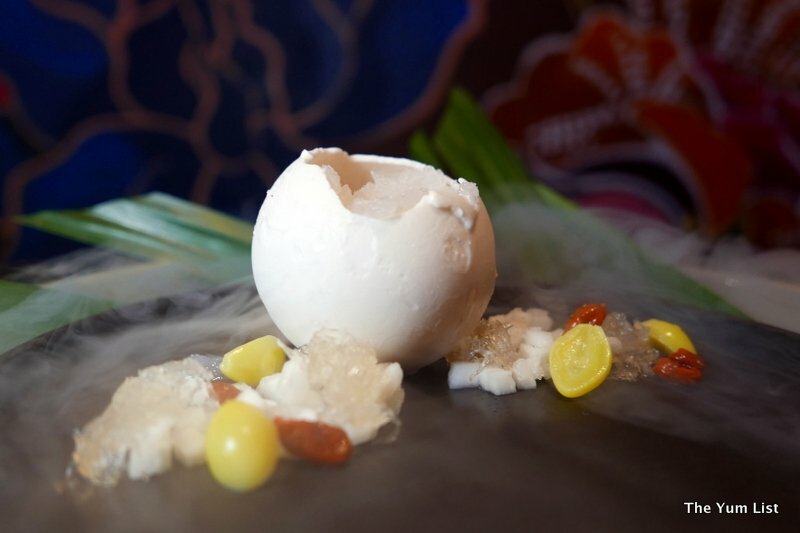 The Bird’s Nest (RM80), from the Central region, arrives as an orbital birds nest of fresh creamy coconut and pandan solidified in a solid shell, encasing a lychee gratiné within. Around its base are chunks of collagen-rich bird’s nest jelly noodles, with finely chopped water chestnuts, goji berries and gingko nuts. For those wanting a boost in their hair, nail and skincare regime, edible collagen contains a more concentrated dose than mere skincare products can provide. Served with a pouring of liquid nitrogen over ice cubes, it’s powerful natural properties are given an ethereal presence. 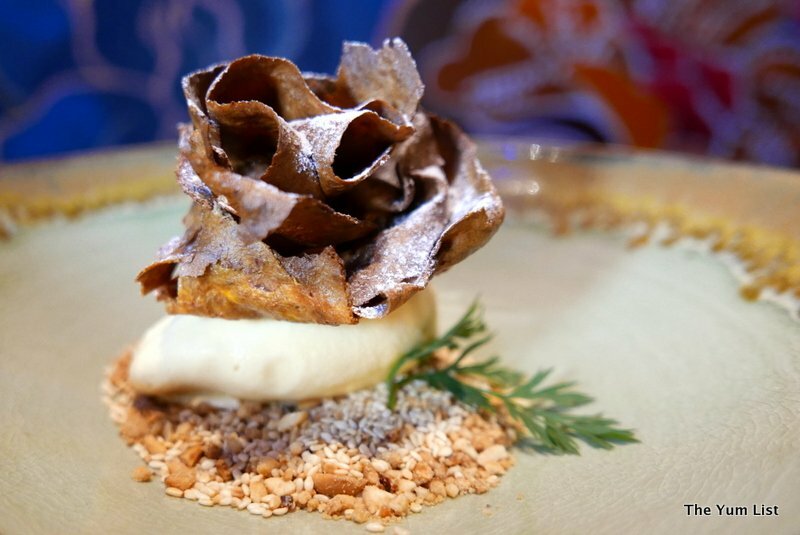 The Banana (RM38) from the North features a spiral rose of dehydrated banana, perched atop sweetened condensed milk ice cream with finely chopped peanuts and sesame seeds. It is a sumptuous experiment in texture, with crackly shards of hardened banana petals and the grainy crunch of nuts and seeds whipped together with smooth and decadently creamy condensed milk. Spectacular in look and taste. Beta KL’s menu is arranged not only by the iconic flavours of each region, but also under headings of Ringan, or light meals, Earth, Water, Land and Manis, or sweet, with additional side orders. Notations for spicy, contains gluten, contains nuts, vegetarian and available vegan options are also made clear for diners, something prevalent in Western countries, but yet to become popular in Malaysia. 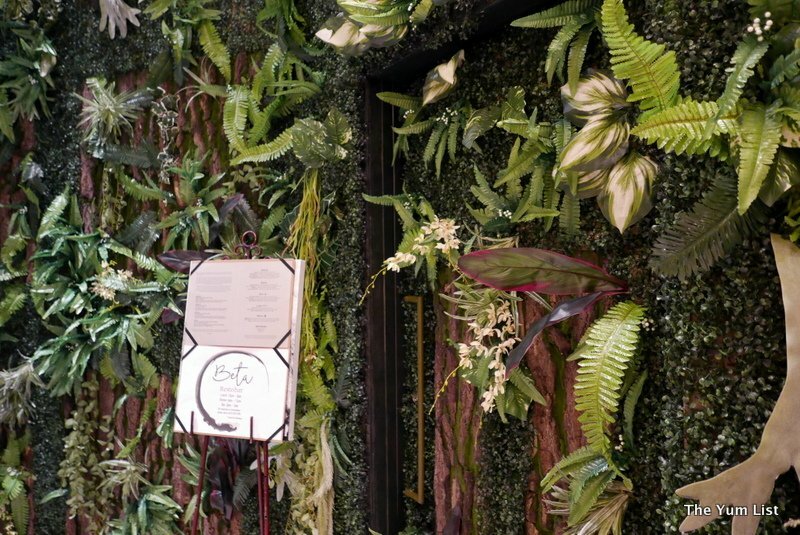 For Malaysians wanting to dine on local cuisine in a luxurious setting, or seeking to impress International guests with a decadent and rich offering of traditional flavours and dishes, a visit to Beta is a must. 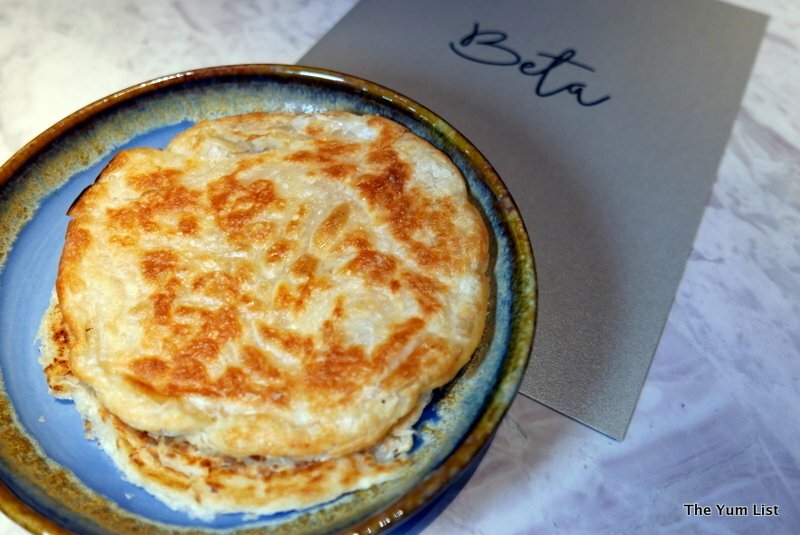 While many fine dining restaurants in KL feature fusion menus with a Malaysian twist, Beta offers a full Malaysian menu. Celebrating the diversity and harmony of culture in this eccentric and multifaceted country, it is a royal education in cuisine for both visitors to KL and locals alike. Love that wooden barrel mug! I like the way the drinks are presented! I like the presentation! I like to taste the duck leg! Bird’s nest for me please, pretty pretty please. LOVE the lighting and decor! Those little barrel cups/glasses are awesome, too! 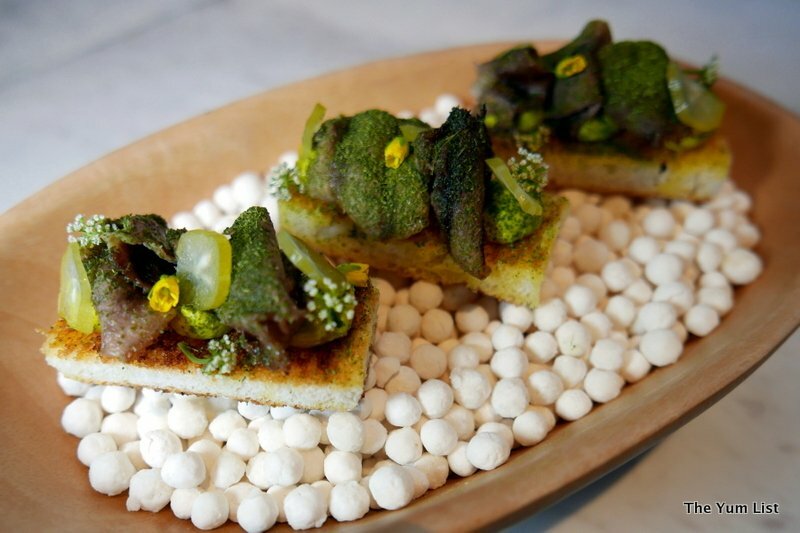 There are some interesting looking dishes that I have not seen before.